Woodward played Molly Thomas the lover of a doctor who attempts to frame a patient for her husband's murder in this black and white thriller distributed by metro-Goldwyn-Mayer in 1964. 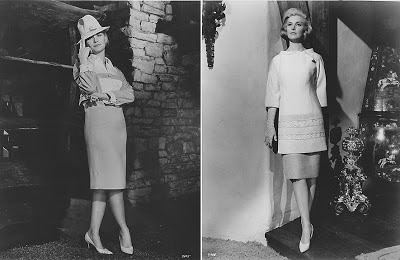 Travilla and Woodward in her on-set dressing room. 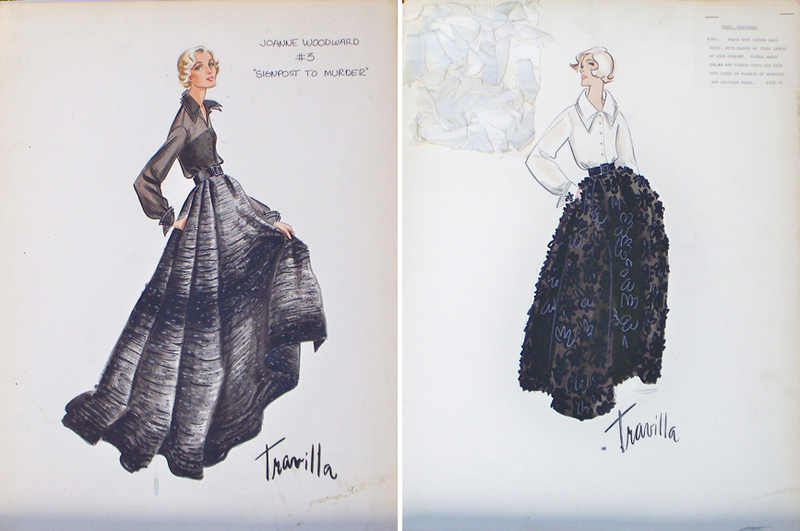 Sketch for the film and one for a Vogue editorial spread. outfit from his 1963 fashion line. As with From the Terrace, Travilla created a fashion line based on the costumes worn by Woodward and traveled around the country promoting it as reported in the March 9, 1964 issue of the trade publication Boxoffice: "The first of a series of fashion promotions by Designer Travilla for MGM's "Signpost to Murder took place February 27 in Alexandria, Virginia. 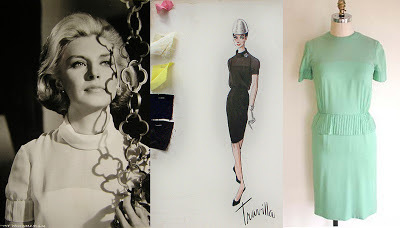 The studio shipped Joanne Woodward's Travilla wardrobe from the film to the southern city for a charity fashion show which was attended by approximately 2000 social, style and civic leader. the theme of the show was Murder in Fashion with Travilla addressing the group and explaining the transformation of a couturier's top designs into motion picture fashions. 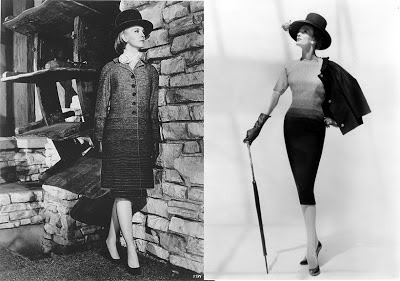 He also showed his latest spring collection exhibiting portrait stills of Miss Woodward wearing the new styles." 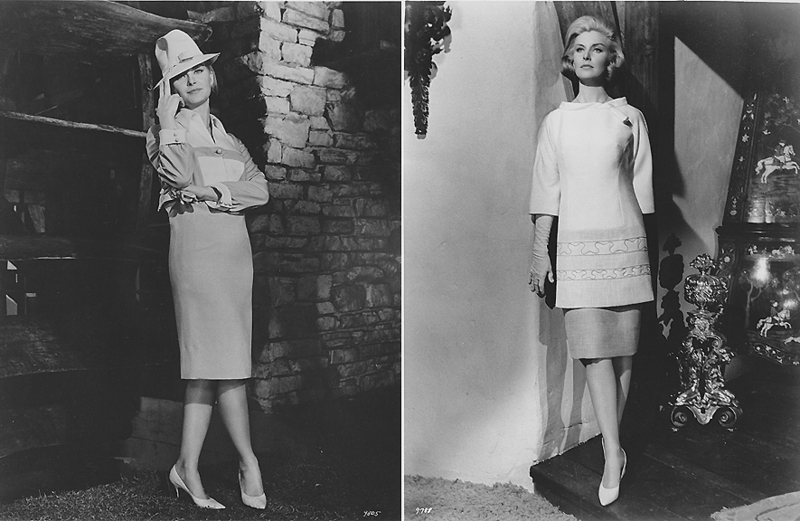 Notice the simplified collar on the retail version versus Woodward's from the film. The collar on Woodward's coat is cut much higher than the retail version. 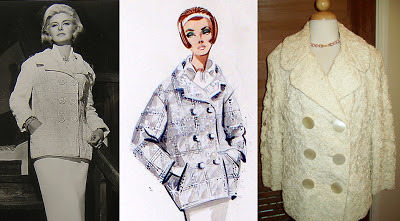 The jacket/evening gown combination above was also worn by Mrs. Elliot Ruel in the 1963 Automobile Show held at the Pan-Pacific Auditorium in October. Selected designers were matched up with a particular brand of car and created an outfit to go along with it. Travilla was paired with the Lincoln Continental and this was his "vision." Travilla would not work professionally with Woodward again for six years, but two years later, with his help, managed to settle an old score with Joan Crawford from 1958. 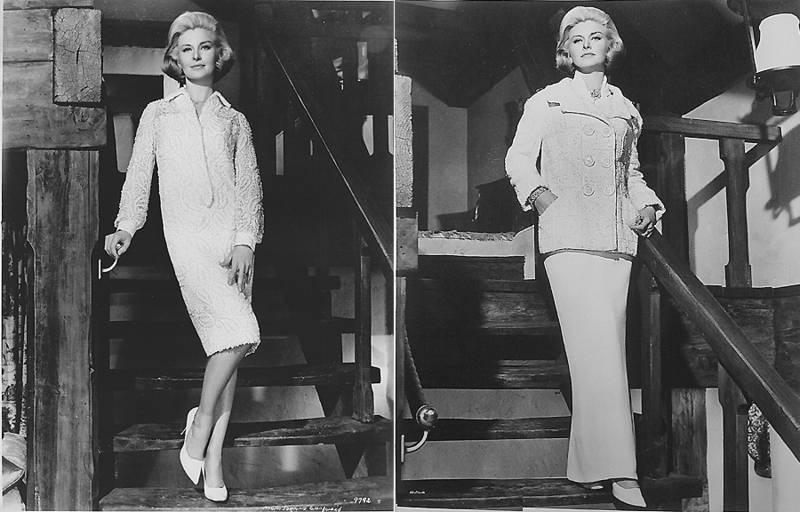 "Joanne Woodward is setting the cause of Hollywood glamour back twenty years by making her own clothes. "the actress told the press in regards to Woodwards announcement of making her evening gown herself at the 1958 Academy Awards. When attending the 1966 Academy Awards ceremony in a Travilla gown, Woodward made the statement "I hope this makes Joan Crawford happy."